I wrote about our fun weekend out on the trails but first you have to check out Crazy’s sales ad here- http://www.canterusa.org/index.php?option=com_content&view=article&id=8836%3Acma-crazy-as-can-be-153-h-5-yr-gelding-in-delaware&catid=48%3Ama-canter-available-now&Itemid=313 He wants his own person and he is just about as easy as they come. He will continue trail riding/paper chasing until sold. 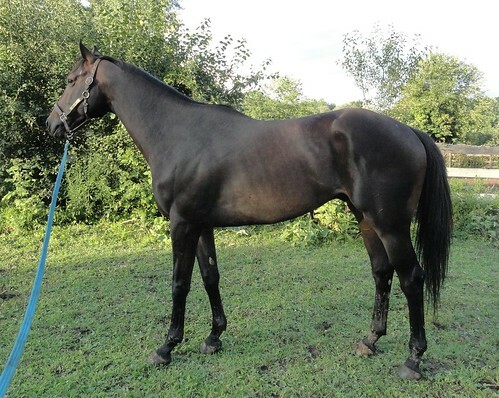 I bought a horse who will arrive today just because I liked his bloodlines 🙂 His name is Blue Desert and he is a nice looking athletic 3 yr gelding. Hopefully he lives up to the expectations. It has been such a busy summer on the farm. I am aiming to sell some horses and slow down a bit for the fall/winter. Right now we have one more horse than we do stalls. I have a couple of nice sales horses getting ready to get marketed soon. Tin Star will be ready very soon. He is lovely and so sweet. I have started riding him now that he has had a few weeks of rest. 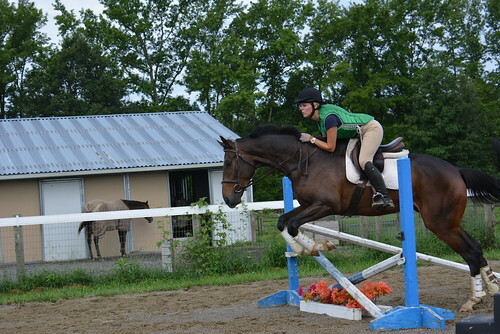 He is very nicely balanced and I think he will be a nice event horse. 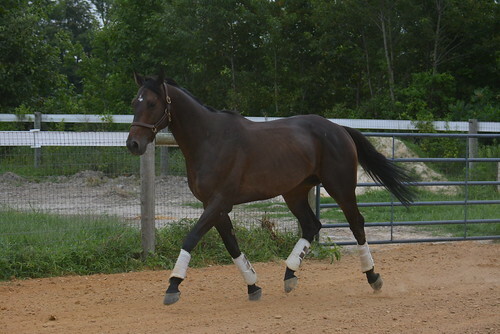 Tin Star is 16 h and 4yrs old. He is priced at $3500 if you know anybody shopping. I call him the Tin Man. The seller kept calling him Tin Man and it stuck. 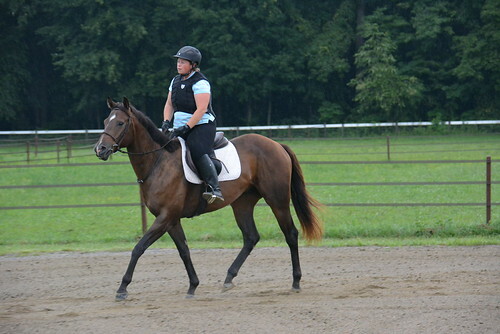 I am going to write another post about Katzimo and his lovely flatwork here soon. He is really coming along. I love him! So many nice horses in my barn that it is hard to pick a favorite. 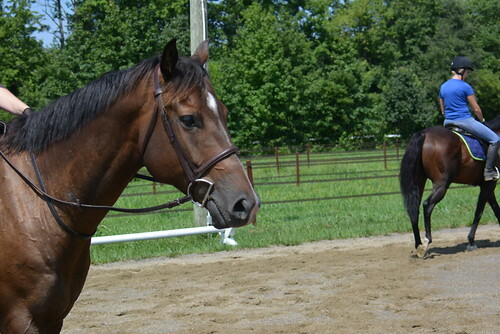 Gib is off in a new home with an eventer who wanted to take a chance on him and didn’t mind bringing him along slowly. I have been getting good reports and I am so excited about his future. Katzimo continues to be absolutely amazing and fun. He is jumping around small courses and seems to really enjoy it. He has such a great attitude about everything. Love him! Crazy as can be makes me laugh hysterically. My friend Jess has been riding him most of the time and we all have a running contest on who is going to manage to get him to canter first. He so far hasn’t cantered under saddle but we know he is capable of cantering. We are going to try it on a trail ride following other horses. Hope to fit that in this weekend. It has been super busy on the farm. I am actually one more horse than I have stalls right now. I did actually sell Misty Galaxy (the gorgeous big 3yr) but I bought another horse soon after who will arrive early next week. I need to get Tin Star aka the Tin Man going. He needed a chance to just relax and he has gotten 2 wks to be a horse. I will start to just do a little bit with him. He is looking relaxed and happy. We got some instructions yesterday and I believe that I will take Katzimo on Friday to get him settled in and let him ride around the grounds a bit. We will likely be doing a demonstration on Saturday. I am sure more details will be coming. I think Kurt and I hope to stay in a hotel there for friday/saturday night so I am arranging barn help. It feels like it is a long time away but just over a month to get it all organized. 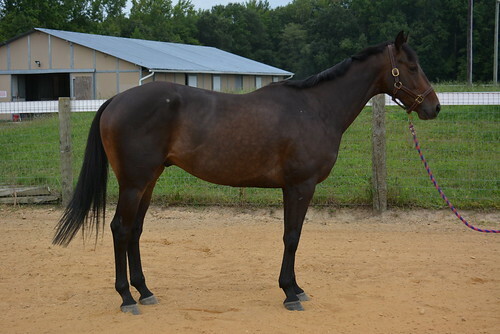 Katzimo will be for sale following the makeover event if you know anybody interested. I need to get crazy marketed as well. I should change his name but I just keep calling him crazy. Poor guy! He will make the ultimate lower level fun horse! It has only been 2wks! I took Katzimo along with Letterman for a dressage lesson with Kelly Mcginn. He stood on the trailer quietly by himself. Walked off and looked around like it was all just another day in the life of Katzimo. I walked him a lap around the indoor expecting him to perhaps be slightly looky especially since the door at the end was open but nope he found it all to be interesting but no big deal. I believe that I told Kelly he had been in work for 3 wks but I looked and it has only been two weeks. Wow, hard to believe. He is just one classy smart horse. We was stellar during the lesson and she thought he was gorgeous. 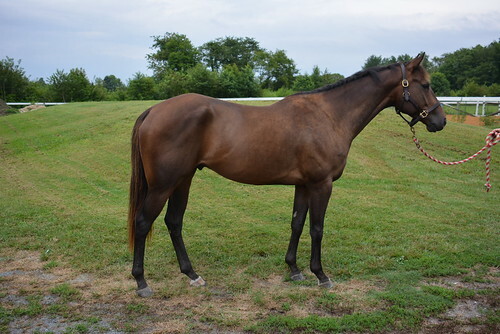 Head over to http://www.retiredracehorsetraining.org/index.php?option=com_content&view=category&id=97:jessica-morthole&layout=blog&Itemid=396&layout=default to see some video and get more details on the lesson. I was just so impressed that this horse has already been on two off the farm trail rides and now a trip to the indoor in less than 2 wks of work. He is so easy and the type that anybody can ride. I expect he will get snatched right up once he is up for sale at the conclusion of the Makeover Challenge. Crazy as can be is also coming along nicely. Sunday tends to be a great day for everybody to come out and ride together. My friend Jess had wanted to give him a try and I took some pictures. Jess is a good rider but does tend to get nervous on the first ride. I know that she trust my assessment of horses but first rides on new horses are always tough. I think it is good that our horses get a variety of different riders. It teaches them to handle different styles and I also get to see if they changes with the different styles. Crazy can be a bit fussy on the ground but again he hasn’t been here very long. I think less than 2 wks for him. He tends to look at things which make you think he could be silly but I think it is just his personality. When you are on him he is about as relaxed and easy as they come. 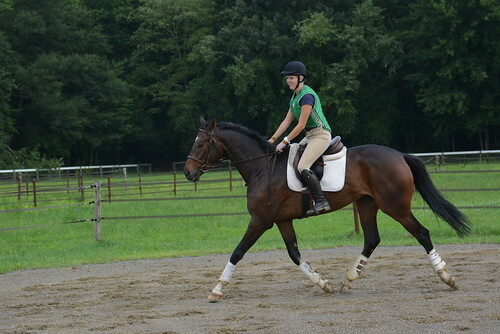 Jess took her time getting to know him and I joked with her that I would be impressed if she could get him to canter. Nope, he still doesn’t canter 🙂 How did they even get him to go at the track!! He is so slow. We think he could be a closet quarter horse. Stick a western saddle on him and go. He has such a good attitude and he didn’t mind the other horses going all around him. 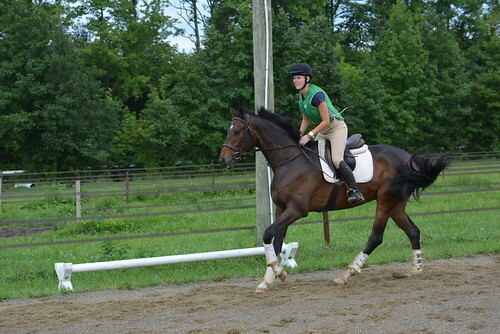 This picture cracks me up because it was when she was working really hard to try to get him to canter. I was dying with laughter. You know you want him!! How can you not want to see this face looking at you every day? I got to take some pictures of Elusive Sky. He was one of my resale projects that sold to Amanda. He is being boarded at my barn and it has been great to watch them. Not only is he fancy on the flat but he can jump! He was a horse that crashed very badly upon arrival from the track. We joked that we needed to hide him behind the barn. He was so body sore all over and just funky. He was very angry and really didn’t care for people that much. I was confident he would come out of it. He is by the same sire as Katzimo and we think they look quite a bit alike. He now is quite sweet and able to enjoy riding because his body feels better. We also tested out my two new resale projects. It is so fun when new horses come in and I am always just eager to see what I have got. When this guy stepped off the trailer I just couldn’t believe it. I knew he was going to be nice but I wasn’t prepared for just how nice. Misty Galaxy is a 16.3 h 3 yr who only ran 3x. He looks like a big warmblood with big feet and huge bone. He is so sweet and just everything that you could hope for in a nice prospect. They had arrived late Wednesday and they got a few days to settle in. We rode Galaxy on Saturday and he was amazing. Tin Star is a 4yr 16h and for whatever reason I keep calling him the Tin Man 🙂 He has such a beautiful head and he is nicely uphill. 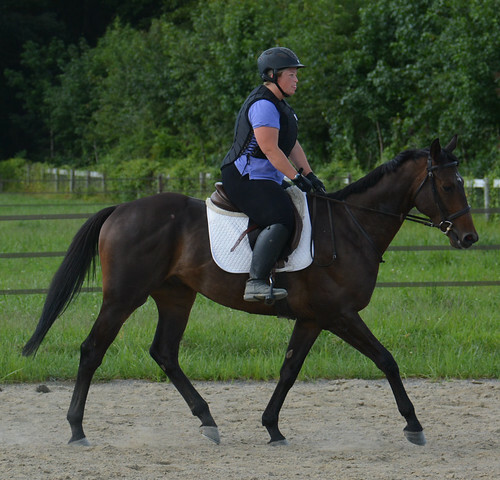 He really soft and balanced under saddle with a great canter. I see eventer all over him! It just seems like every horse in the barn is so darn nice to ride. Letterman was awesome at my lesson and I have been getting the best rides from him lately. Love my CANTER horses and these two resale horses are lovely. Fun stuff! I do need a barn name for him because I refuse to call him crazy 🙂 Crazy has been hanging out in the CANTER fields for over a year now. They become a little bit feral in some ways but it makes them really eager for a job. When he arrived he instantly became attached to another horse and it was a bit of drama for the first few days until he got the hang of the program. This is one reason I do like to give them a few days to settle in. He had went from one CANTER farm to another CANTER farm and then to my farm. That is a lot of change! It is interesting that when they start to get a bit of grain and realize that a stall can be a resting place they begin to relax and not worry so much about their friends. I saw that he started to really enjoy coming into his stall and I knew he was ready for some work. We took him out for some conformation shots and he stood up so relaxed which was a change compared to some who find putting four legs in some sort of organizing fashion to be the biggest challenge they ever faced. Getting one good standing shot can take 15 min at times. We took a few pictures and got what we needed. I just like to document the before pictures because I love watching them change. Kurt had started giving him 3lbs morning and night of grain and I asked if he had gotten a good look at him. This horse isn’t one that needs a lot of grain. The horses on the farms don’t get grained and for the easy keepers I like to just put them on a ration balancer. He is eating 1lb am and pm of Triple Crown 30%. Shouldn’t need anything more unless he starts to drop weight when he gets into work but he is a chunky guy and I doubt that will happen. His feet are short so he is a bit ouchy but I am not sure what I will do about that just yet. When they have been on the farm for a year they are used to being barefoot and they have such quality hoof wall which is nice! I took him out tacked up and walked him around. He looked at things and made some snorting noises but never reacted. He is aware but we pegged him as an internalizer. He may be scared but you aren’t going to know it. I then put him on the lunge line for few circles just to make sure. Better safe than sorry always being my motto 🙂 He had zero clue how to lunge and was snorting at the lunge whip but made a really good attempt at trying to do what I asked. He trotted really slow and kept his eye on me but it was clear he was relaxed. He stood perfectly at the mounting block and Kurt lead me a lap around. He just felt relaxed which is what I am aiming for so I went off on my own and we did some nice trotting around. I tried the canter..tried being the main word. He didn’t think that gait was required in his new life and I didn’t want to get after him on the first ride. I should have had my stick but honestly on the first ride I always try to make it stress free. We know they canter so why force it! It started to pour on us but he didn’t seem to care. I hopped off and he walked in the barn with confidence. Almost like he was strutting now that he was back into work. He LOVES treats and boy does he like to eat. 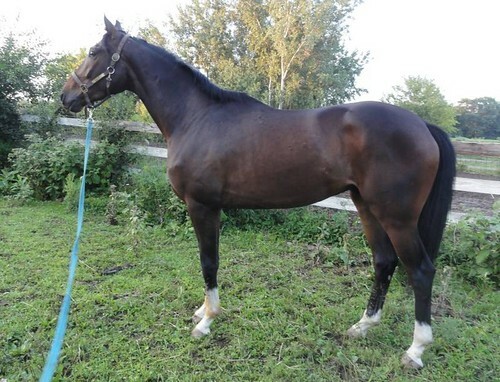 He has a really sweet personality and I am guessing he is going to be a really nice all around ammy friendly horse. He is really comfortable to ride. 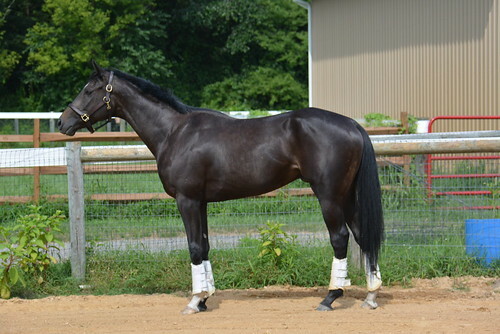 I had an awesome ride on Katzimo at Fairhill over the weekend. What a very cool classy horse. He was beyond awesome and went over bridges, in the water and through tunnels. He seems more relax than most horses heading out into such a busy environment. I had intended on doing some flatwork with him last night but got rained out. Uh! Katzimo aka Mo is super cool! I am having a blast working with Katzimo. He seems to enjoy having a job again and has quickly taken over as the leader of the pack in the field. He got his shoes on and now that his feet feel better he is strutting his stuff. He is quite enjoyable to ride. Very soft in the bridle with a can do attitude. So far we are just doing some basic walking and trotting but I did a bit of canter the other day. He is out of shape so right now I am just building the foundation. We went on his first off the farm trail ride this week as well and he was super. We were absolutely eaten by mosquito’s but he didn’t seem to internalize it at all. He happy walked and trotted on a loose rein. Looked at things but was happy to lead or follow. 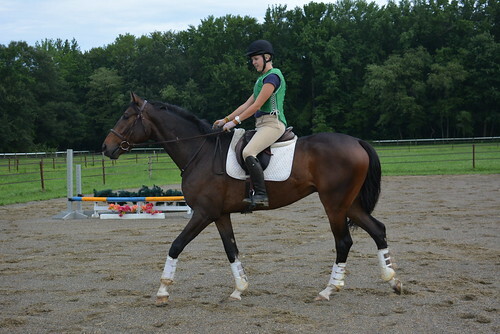 I think I am going to take him to Fairhill this weekend to ride with a friend. My two Gude horses went off into new homes. 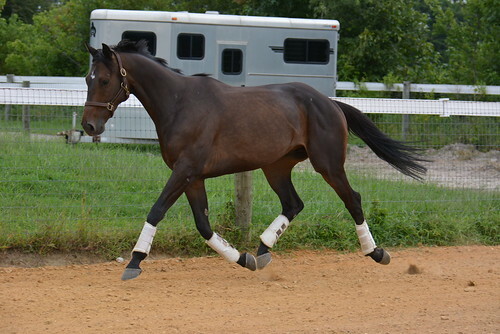 Gude Affair is with an event rider in VA and Gude Gone Wild went to an event rider in North Carolina. I have gotten great reports and can’t wait to see them out and about. We are going to pick up crazyascanbe tomorrow. So excited. Isn’t he adorable??? I am glad I will be back up to two CANTER horses. I like doing my own resales but it really is rewarding to have the CANTER horses. I will have Katzimo and Crazy in training. I likely will fill my other stall with another resale project of my own when I find something I like. The CANTER MA auction is getting ready to start-up. This is a HUGE fundraiser for CANTER and brings in much-needed funds to support our program. We are asking for donations of anything you can think of that people would want to bid on- items, services, baked goods, vacation houses, etc. Please email me at jessicamorthole@yahoo.com if you have anything you would like to donate to CANTER or if you know of people that we should reach out to. I will be sure to post some pictures of crazyascanbe here soon. Barn name??? ?